A reader with 26 essays by 29 authors from South Africa and Europe. How is it possible that the people procuring one of the world’s most valuable metals for a „socially responsible“ company such as BASF have been living in slums for decades? Maren Grimm is a German documentary filmmaker, author and political activist based in Hamburg, Germany and Vienna, Austria. She teaches at the Academy of Fine Arts Vienna as well as in independant networks. Together with Jakob Krameritsch, she founded the Plough Back the Fruits campaign in 2014 after discovering the involvement of the German chemical enterprise, BASF, with the Marikana massacre. Jakob Krameritsch is a historian working at the Institute for Cultural and Media Studies at the Academy of Fine Arts Vienna, Austria. Together with Maren Grimm he initiated the 2014 Plough Back the Fruits campaign which focuses on the platinum-supply chain of BASF (http://basflonmin.com). 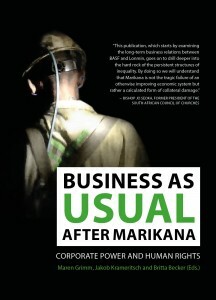 In 2013 he edited the German version of Marikana. A View from the Mountain and a Case to Answer by Peter Alexander, Thapelo Lekgowa, Botsang Mmope, Luke Sinwell and Bongani Xezwi. Britta Becker is a sociologist working as a project manager in the Africa department of Rosa Luxemburg Stiftung, with regional expertise on Southern Africa.